Question: Is Spore Spacey Enough? As you can see on my About page, I’ve got specific rules as to the games I cover here. Why? Because I need the focus, and I need the focus to be tight, lest I go mad. Over on Broken Forum, I created a thread discussing space games, and one of the users, Gus_Smedstad, tried to convince me that the space section of Spore was really excellent, very much like Starflight or Star Control II. I was VERY dubious of this, but figured I’d give it a chance once I could get it for cheap. Well, fair warning: I found the space stage of Spore a tremendous disappointment, after eagerly awaiting the game for years. Yes, it’s a sandbox, and yes, there is a 4x space game there, kind of. However I find it practically impossible to actually enjoy either the 4X game or just exploring in the sandbox: You have one ship (well you can enlist a few others, but they all travel together), so there’s no management of various ships like in an RTS or a turn-based 4X game. Your own ship has to go do everything everywhere. Worst, the homeworld is continually harassing you for various needs, most usually pirate or enemy attacks. You can’t wander off and explore, or work on some other project such as terraforming, or just earning some cash, for more than a few moments before you get some emergency calling you all the way back to homeworld. If someone can advise how this situation is to be avoided, I’m sure I’d appreciate the space stage of Spore a lot more, but right now I have it pegged as a frustrating experience, especially painful because it had so much promise. Drat. I still want to love this game so very much. The terraforming mechanics alone are pure genius in their clarity and simplicity. I’m hoping to learn some secret that’ll make it more playable. I think I’m in the majority with saying I enjoyed the space stages of Spore. I think they’ve also patched it at some point to remove the constant ‘pirate’ and other faff missions’ frequency – I played through it again last year and seem to remember being able to tinker around a lot more than the first time I played it at release. I had a lot of fun terraforming and creating my own little empire, and meeting up with the random neighbours. But for some reason never completed it! Edit: ehhh minority.. not majority! i played this a few months ago. and i couldn’t even make it to the space part of the game. that was the main reason i wanted to play it. but after about 5 or 6 hours i just gave up. the game has some good things going for it but theres just too much mire you have to wallow through. Later he learned how to play larva level, then creature, then tribe and city. Now he’s 7 – he skipped space section of the game for now and focused on creating space adventures – the add-on option. At 4-5 y.o. he got the idea of planets turning around suns, atmosphere shield and terraforming concept. 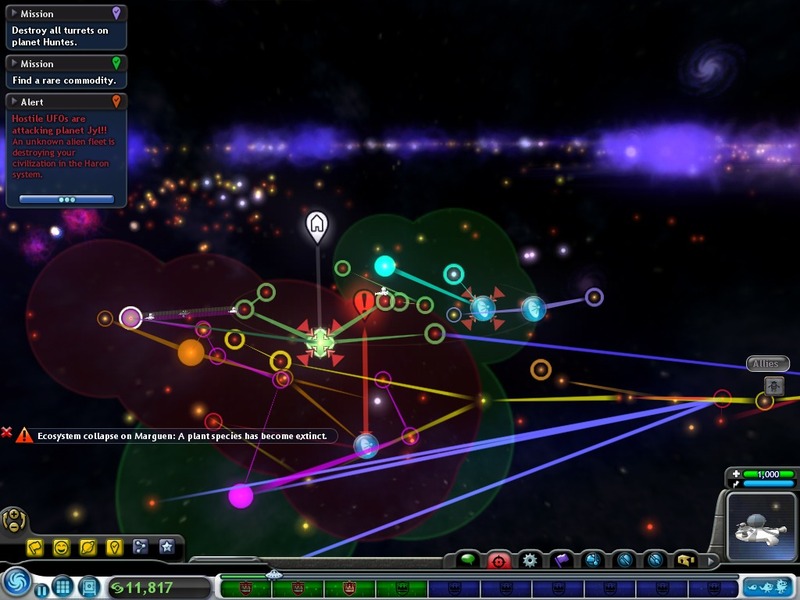 I’ve never been into the game myself, and yeah, I’ve heard that the space part is tedious and cumbersome, but I worship Will Wright for what he’s done with Spore as an educational material for my son. Yes, I’ve been letting my son play Spore for about the last two years. he’s 6 now. My reasoning was that he was interested in lots of the kinds of games I prefer to play: MMOs or RPGs, strategy games of various sorts, and 4X space games, but what I play is far too complex for him. I used Spore as a “primer”, since its creature stage is a simplistic walkabout “first-person eater”, and its tribal and civilization stages are very simplistic RTS games. He loves Spore and probably plays for a few hours every couple of weeks. This play has given him exposure to the things you need to look for and do in these game types, and experience using the typical UIs. The space stage doesn’t annoy him like it annoys me, because he is not to the point where he establishes his own complex agenda: the interruptions from the homeworld just don’t bug him. Or he ignores them and loses his homeworld. No skin off his nose. Last week he started playing Space Empires V, and I attribute much of his ability to understand that game to his time playing Spore.